Having a good pocket knife is essential for anybody who works with their hands. Whether it’s your everyday carry, for hunting, or some other use, we break down our recommendations in several categories to help you make the best decision possible. We’ve also included some notes on all of the factors we considered in our research. Overall, we found that there are several great knife manufacturers who make their products right here in the USA. Buck, Gerber, and Case are some of your most popular ones (and with good reason), but we also found some lesser known American made manufacturers who are making some of the best pocket knives in certain categories and somewhat flying under the radar. Check out our top recommendations in the chart below, along with more detail about each one below that. Take a look at our in-depth analysis below for each of our top picks. We outline additional details for each product, what we like, what we don’t like, and any additional products that deserved a shout out. Buck Knives is one of the most reliable knife manufacturers in the USA, making several great product lines. 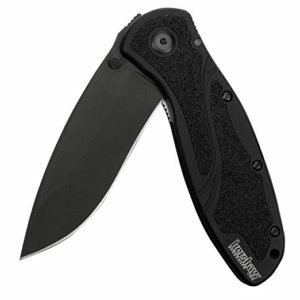 The 112BRS Ranger Lockback Folding Knife is a 3-inch steel knife with a clip blade shape. A reliable tool for everyday use, and the smaller version of the 110 Hunter made by Buck Knives. It has a good weight to it, 8.5 ounces – not super heavy, put feels solid in your hand. This knife has a nice woodgrain handle, made of dymondwood. Don’t store the knife in the black leather sheath for long periods of time. Chemicals used to treat the leather can cause discoloration on the knife. The Gerber Gator is the best basic hunting knife we found on the market, made in in Portland, Oregon, USA. It locks up well, can easily be opened one-handed while your other hand is occupied, and has a very simple design. No fluff, just performance. It has a reliable rubberized grip and comes in a clip point (pictured) or gut hook blade version. The blade is roughly 4-inches long, plenty big for most use cases. 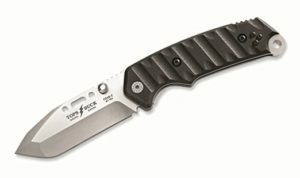 The Buck CSAR-T Tactical Folding Knife is great for any heavy duty work, inspired by the needs of our US military operators in the field – reliable, heavy duty, and easy to carry. It has a 3.5-inch steel blade (5-inches in total closed length) and a grooved handle, which we found resulted in a surprisingly secure grip. 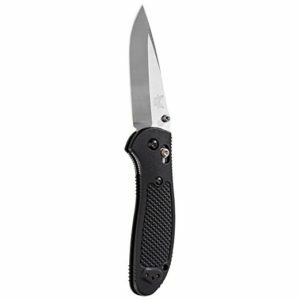 The Kershaw Ken Onion Blur Folding Knife is a great option if you really value ease of opening and carrying a knife that is lightweight. This knife comes in at 3.9 ounces in weight and a SpeedSafe assisted opening – an easy push on the thumb stud at the base of the blade opens the knife quickly. The steel blade is 3.4-inches with a DLC coating, a fancy name that really just means it’s hard to scratch and has additional corrosion resistance. Great multitasking knife. Liner lock is sensitive. Easy to open, easy to close with a light tap on the back of the knife. Just like the name implies, the Benchmade Griptilian is a tough knife to let go of. It has a GFN (Glass Filled Nylon) handle that, for its weight, has great strength. 4.8 ounces in weight with a 3.45-inch drop-point style blade. The blade is made of 154CM stainless steel, which helps in not only strength, but rust prevention as well. We found that this knife also holds it edge very well after several uses. Made in Oregon, USA. The Spyderco ParaMilitary knife is two-thirds the size of its big brother (the original Military) with a thin profile, and still boasts good strength and durability. The blade length is 3.4 inches, it weighs in at just 3.9 ounces, and has a blade thickness of merely 3.5 millimeters. Good for most everyday use if you’re looking for a sleek lightweight knife. It has a nice textured handle for a good solid grip as well, and it’s easy to open. 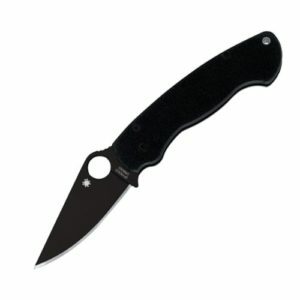 It incorporates Spyderco’s new Pivot Bushing System, which makes opening and closing the blade feel super smooth without feeling unstable. Made in Golden, Colorado, USA. 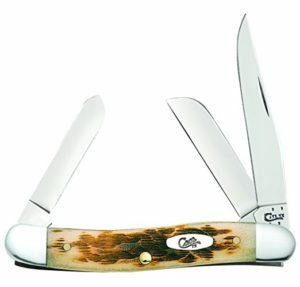 Case is a classic American made knife manufacturer, known for their handcrafted, smaller multi-blade pocket knifes. The Amber Bone Stockman Knife comes in 43 different colors and variations. The small size makes it good for a lightweight everyday carry or as someone’s first starter knife. Comes with 3 blades: Clip, Sheepfoot, and spey blades. Blades on this knife are made with Case Tru-Sharp Stainless Steel, which offers good long-term durability and corrosion resistance. After all, what’s a good knife without a quality blade? We looked for a few different things related to quality: the type of steel used, durability/longevity, coating used (if any), the type of blade cut, and the size. Each of these characteristics are vital to the success of a good pocket knife. Our pocket knife recommendations passed all of our safety quality standards. We want to make sure we’ve giving recommendations that are safe for you and your family. We eliminated several knifes from our consideration that have had a history of being unreliable, opening unexpectedly, or having a variety of other issues. A good pocket knife needs to be relatively easy to open, especially with one hand if you only have one available. However, there are some knives that were easy to open and did not pass our test, primarily because their sturdiness was questionable. We looked at several knives that were just too stiff, and thus didn’t make our cut. All of our recommendations passed our opening tests. We eliminated several pocket knives from contention where we felt like the quality did not live up to the cost. After all, we want to make sure you’re getting the best pocket knife for your money! Common issues we saw with some brands were: lack of significant product warranty, unnecessary features that don’t add valuable functionality, and general lack of durability.